In 1936 President Roosevelt’s “New Deal” program, the Civilian Conservation Corps, established the Hillsborough River State Park, where nature and history continue to come together for Florida's citizens and visitors. Today this 3,383 acre state park—among Florida's first—allows guests to experience environmental diversity, meet wildlife, and spend quality time outside in the "real Florida." Whether you bike, bird, hike, paddle or picnic, this park will impress you. You can also experience real Florida history here. 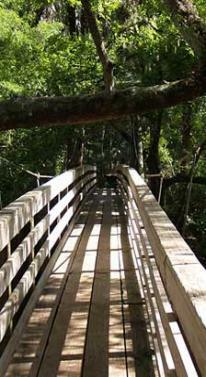 The bridge built by the CCC still spans the winding waters of the Hillsborough River, pavillions and buildings constructed in this era remain in use. A replica of Fort Foster is the stage for reenactments that bring the conflicts of Florida's pioneer days to life. The park relies on the Preservation Society to support it's mission and ensure that it remains a showcase for Florida's nature and history. Whatever your age, skills, or abilities, you can be a part of the Hillsborough River State Park family! Everyone who loves the Hillsborough State Park can find a way to help tell its tale and protect its rare natural and historical features.